Summer students Andy Ton, Daniel Rosich and Estephanie Henriquez along with Fort Edmonton Park interpreter Cedrich Reimer, presenting a reenactment at the 90th anniversary celebrations of Blatchford Field. 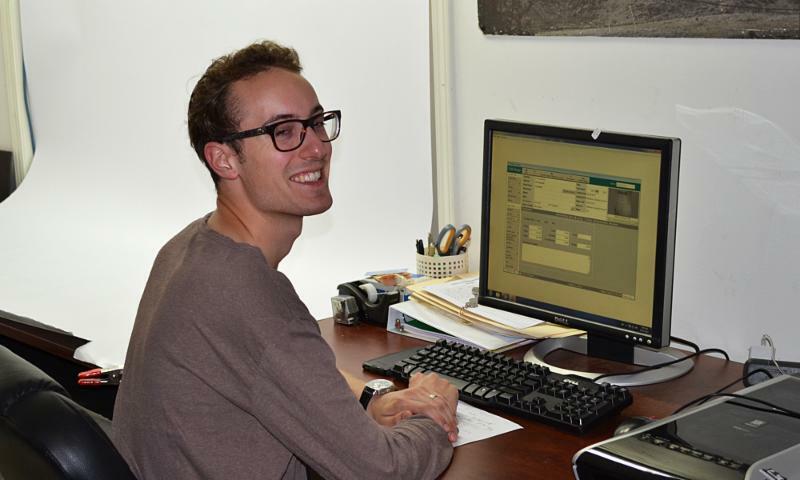 Summer student Matthew Zorzetto-Vermeire works in the museun Archives and also helps out with the kids drop-in program. If you are looking for something to do with the kids this summer, or just searching for a place to bring visitors and relatives, don't forget the Alberta Museum is waiting to take you on a trip back in aviation time. We have extended our weekend hours from July 1 to August 31. The museum will be open Saturdays and Sundays until 5 pm. We have also added additional drop-in programs for children 2-6. They will now be held Wednesdays, Saturdays and Sundays from 11 am to 12 pm. Our volunteers will lead activities designed to educate and entertain young minds. Learn all about clouds, find out how insects camouflage themselves to evade predators and explore the mysteries of flying a kite. The drop-ins are free with regular adult admission. We are also adding guided tours at 1 pm on weekends to make sure visitors can learn all the fascinating history and anecdotes Edmonton's aviation heritage has to offer. In addition to our regular volunteer guides, we have hired three summer students whose enthusiasm you are sure to find infectious. Note: The next issue of From the Hangar will be published September 1, so until then, keep a close eye on our Facebook and web site to make sure you don't miss anything. And be sure to stop by the museum this summer to find out why "History Takes Flight" at the Alberta Aviation Museum. We are asking all members, supporters, and anyone else who receives these regular emails from the Alberta Aviation Museum, to update their contact information. This is necessary because of new federal regulations that require us to have "express consent" from all subscribers. If you have not already done so, please go here and fill out the form. Don't miss out on the latest museum news! We have lost two members of our museum volunteer family. 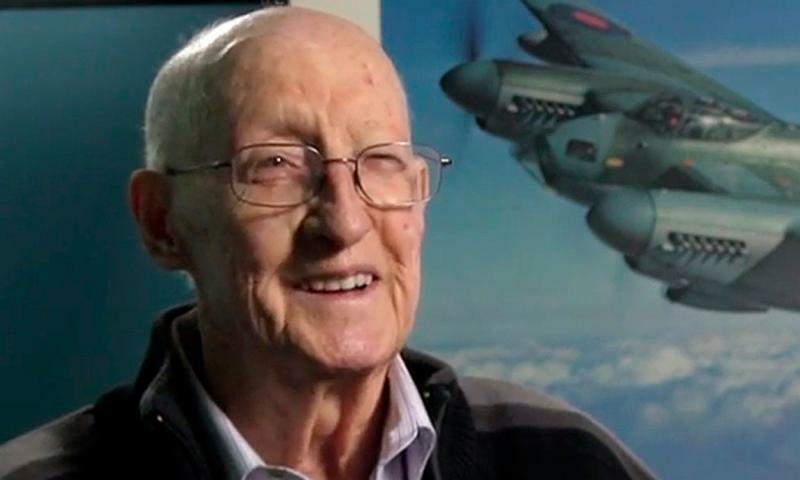 Cliff Rhind, a World War II Mosquito pilot, who helped out for many years in our library, died June 15 at the age of 94. 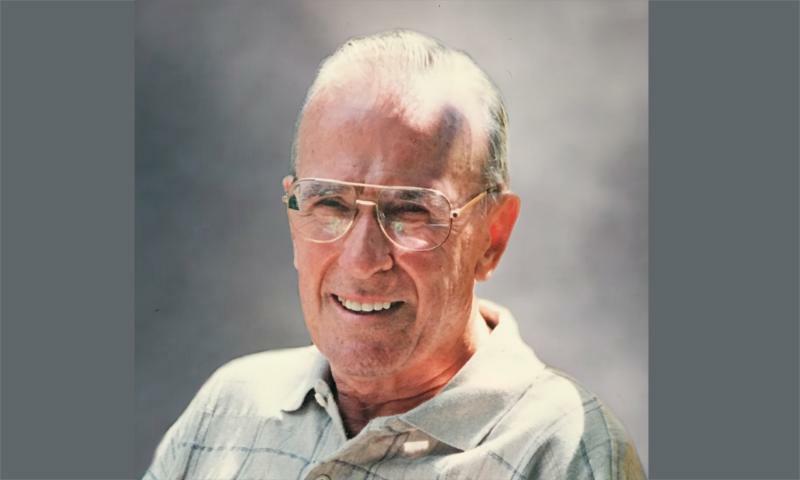 Ted Allen, an accountant, who served on the Alberta Aviation Museum board during its early years, died June 17 at the age of 88. Rhind was a unique connection to our de Havilland Mosquito. He loved telling visitors about the famous and fast World War II fighter/bomber. "They were beautiful to fly, so easy on the controls," he remembered during a 2014 interview for our Blatchford Tales Oral History series. Rhind, who had spent two years in Training Command overseas before getting a chance to fly operational duty, never got any actual instruction on the Mosquito before taking it aloft for the first time. He remembers only being handed a 40-page booklet. "There it is. Study it and when you are ready to fly, take it,'' he was told. "I got in it, taxied around and checked all the instruments...and away I went." You can find part of Rhinds' Blatchford Tales interview here. His obituary can be found here. There is also an Edmonton Journal interview from 2015 you can see here. Ted Allan, spent much of his free time putting his accounting expertise to work helping Edmonton charities including the Kiwanis Club, the Canadian and World Figure Skating Championships, the Canterbury Foundation and the World University Games. Fortunately for us he also served a stint as treasurer of the Alberta Aviation Museum. "He was the treasurer when I first served on the museum board," current AAM Pesident Rod MacLeod remembers. " We had a computer failure with no backup for our accounts at that time. Ted put in endless hours reconstituting the books so that, among other things, we could retain our charitable status and our casino license. Ted was a very quiet and self-effacing guy, but the museum would probably not still be open if not for his efforts." Allan's obituary can be found here. We were also honoured last month to receive a large donation from the estate of another former museum volunteer, Juanita Elsden. As a young women, Elsden was hired to work in the fabric department at Aircraft Repair Limited. She went on to work there (later called Northwest Industries) for 36 years. During the early days of the Alberta Aviation Museum Elsden helped with the fabric work on our iconic Fairchild CF-ATZ. She also assisted with fabric work on one the Noorduyn Norsemans. Elsden died last October at the age of 103. It's volunteers like these who make our museum possible. We pay tribute to all those past and present who donate their time. Without them we could not keep the museum doors open to the public. 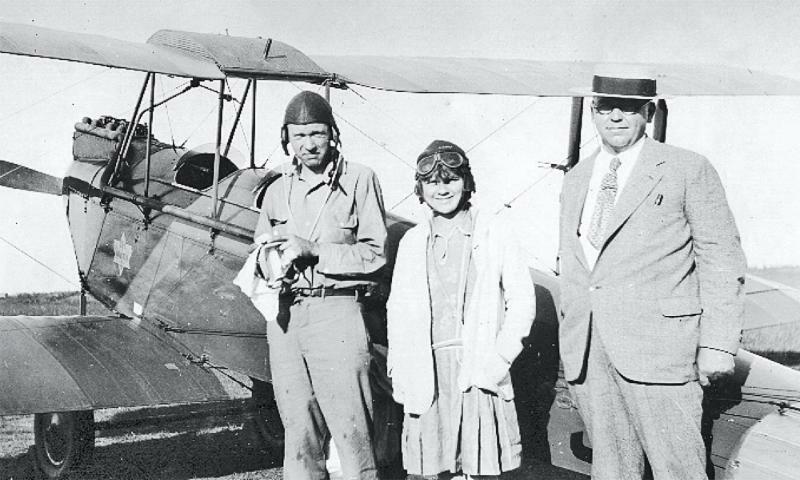 Wop May, Grace Blatchford and her father Kenneth Blatchford after the famous bush pilot took the younger Blatchford for an airplane ride. Denny May, son of Wop May, presents picture at left to Patricia Barford, Kenneth Blatchford's granddaugher. Thanks for all those who attended our fabulous Blatchford 90th Anniversary celebrations. It was a hit with kids young and old. 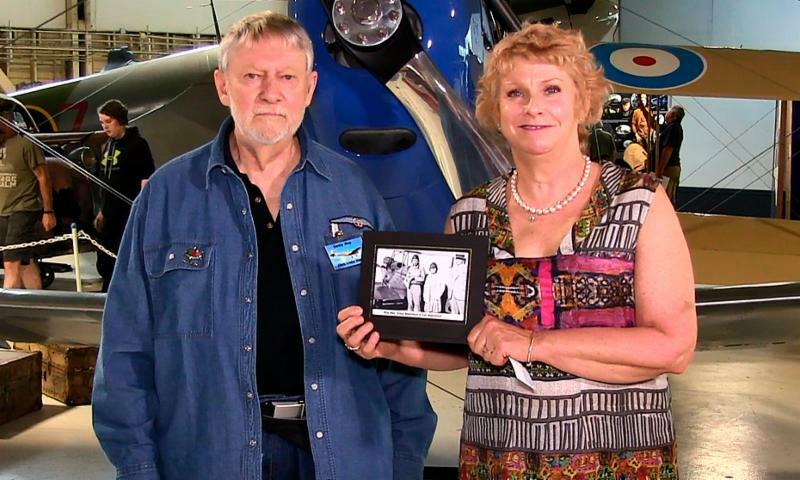 Very special thanks to Denny May, son of Wop May, and Patricia Barford, granddaughter of Kenneth Blatchford, the airfield's namesake. And special thanks to our staff, volunteers and summer students. We couldn't have done it without your hard work. Read more coverage of the event and see a gallery of photos here. August 19-12, Edmonton Airshow. 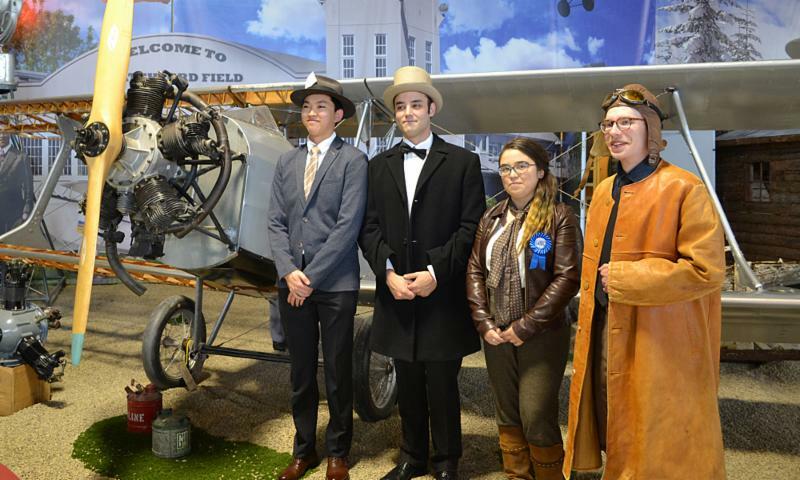 Look for the Alberta Aviation Museum booth, where we will be hosting dress-up activities, selling T-shirts and memorabilia, and telling the story of our work preserving Edmonton aviation history. For more details about the Edmonton Airshow and tickets go here. September 23, 10am to 5 pm. Open Cockpit Day. Your chance to experience our iconic collection of historic aircraft from the pilot’s seat. Family activities, tours and presentations. More details soon.